Deepak is a passionate Creator, Executor and brings along multiple creations including Software Company, Social organization, Various Initiatives, programs, movies and process models. His avid love for experimentation and taking offbeat paths filled with ‘crazy’ ideas has been a visible colour in his self –made professional journey. His rich experience includes Managing Talent and People functions in IT industry. Before Lemon ideas, he has co-founded ONE Foundation and Lambent Technologies (Now GlobalLogic). Nitin has over two decades of experience in guiding & managing start-ups / established organizations in India and Asia Pacific region. Executed engagements in industry domains such as Insurance, Financial Services, Information Technology & Software Services, ITeS / Business Process Outsourcing, IT Infrastructure, PC Manufacturing, Media & Publishing, Consumer products & Retail. Vishal has been a software engineer/consultant with Microsoft, Symantec, Accenture, and Avanade, where his roles included enterprise product and services strategy, design and delivery, product and portfolio management, and global technology management, and he mentors startup accelerators and incubators throughout the United States and India. He also leads Kellogg Entrepreneurs Organization, Los Angeles Chapter. He is a founder of both Netvega Solutions, an IT services firm focused on providing services and solutions for small to mid-market companies, and VDOSH, an investment and advisory firm focused on growing technology startups in the early stages of their development. Sourav is a seasoned entrepreneur in media and entertainment with over two decades of experience. His early entrances in the field of entrepreneurship made him learn many new things and travel different ways to find solutions and achieve success. He is a well-connected and jovial personality with high degree of vibrancy & fun. 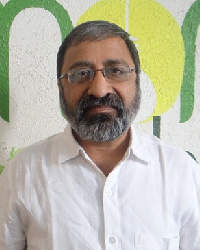 Dr. Prabodh chairs the Self & Psychology faculty at Lemon School of Entrepreneurship. Dr. Prabodh is the Director of Institute of Psycho Management Studies. He is a Spiritual Psychotherapist and Founder President of the Association of Counsellors and Psychotherapists, Nagpur. He had stints at the Reserve Bank of India as Consultant & Professional Counsellor and Institute of Management Technology (IMT), Bhavan’s College of Management and Department of Business Management as visiting Faculty. His vast experience and deeper understanding of human psyche would help lemon entrepreneurs discover themselves and get to the more awareness state. Poonam is Director with Lighthouse People Services. She is M.S. in Psychotherapy and Counseling, M.Sc. In counseling psychology, Master NLP Practitioner, USA, Advance TA practitioner and member of SAATA. She is keenly on experiential learning path on various self learning processes and techniques including Vipassana Meditation and Spiritual Life Integration. Her experience with youth and understanding their mind-set makes her the right person for Lemon to help participants self-discover themselves and bring the right career alignment. He C.A. by education, Shivkumar Rao has more than 20 years’ experience in Logistics domain. He is founder of R & Y Logistics Private Limited, one of the first logistics venture in Central India to handle Exim cargo. Manish Jain is co-founder of Swaraj University, Udaipur and founder-coordinator of Shikshantar Andolan which has been significant in shaping the larger un-schooling movement & unconventional education models in South Asia. Sanjay is the CEO of Shells Advertisements and a specialist in Strategic Brand Communications, Creative Concept Development & Writing for Campaigns, Brochures, e-Brochures, Presentations, Websites etc. He is been faculty for Brand Management at IMT and at Department of Business Management with more than over 13 years of teaching experience. Shells Advertisements is a highly professional, full service Advertising Agency with a proven track record of over 25 years in leveraging its strategic and creative abilities to build strong brands. S. Jeyavelu, a Fellow of IIM-Ahmedabad, is an Organization & Leadership Consultant. He is currently an adjunct professor at IIMK and has many published papers and cases to his credit. Prof Nagaraja Prakasam, (a.k.a. Naga) is Founder Chairman of Native Angel Network (NAN) and member of Indian Angel Network (IAN). He has been mentoring various Incubation Centres across premier Colleges & Institutes.At Lemon he would be mentoring the startups in a social cause, he is a renowned personality in Indian Start-up ecosystem with a passion for social and agriculture bases sustainable growth. Naga is one of the most renowned Angel Investor, Mentor, Fund Adviser in India with a keen eye on investing and working with early age start-ups. He is Mentor in Residence at IIM Bangalore Incubator (NSRCEL). He is part of many startup ventures including Uniphore, GoCoop, Saahas Zero Waste, Fresh World, Happy hens farm, SP Robotic works and many more. Dr.Uniyal is the founding faculty member at IIM Kashipur where he was also the first Chairperson of Placem ents and Corporate relations. He ran two incubators and funded two businesses at different business schools and mentored many entrepreneurs among his participants. Rajeev Roy became an entrepreneur soon after completing his PGDM from IIM Ahmedabad. He was an entrepreneur for nine years before he joined academics. His ventures include food processing, agriculture and knowledge process outsourcing. Currently the Chief Gardener at the Lemon School of Entrepreneurship (LSE), he taught entrepreneurship for over nine years and was a full time faculty member at Xavier Institute of Management Bhubaneswar (XIMB), IIM Raipur and Loyola University Maryland. He has mentored several entrepreneurs and is on the advisory board of National Entrepreneurship Network (NEN). He has been an advisor or a consultant to several governments and multi-lateral organizations on the development of entrepreneurship. Books authored by Dr. Roy are Entrepreneurship: Text and Cases. Oxford University Press, 2008, 2nd Ed. 2011and For-Profit Value Chains with Malcolm Harper & John Belt. Practical Action Publishing, UK 2014. Praveen is a passionate technology developer with 12+ years of experience in mobile software development. He has witnessed the evolution of mobile technology since last decade and has been part of the transformation and changes in mobile space. He is VP (Engineering) with XYMOB and has previously worked with leading product development companies like Autodesk, GlobalLogic and Lambent. Pioneer in developing location platforms for wireless operators in Asia and North America. Shishir is a Chartered Accountant by profession. He has completed his Master’s degree in Commerce and Business Management and also has a diploma in Co-operatives and Accounts with 15 years of experience. Dr. Chetan is practicing counselor and psychotherapist. He is working as a Trainer & Mentor for Insurance sales professionals. Mr. Sanjay Singh is a renowned Sales Coach and mentor. He is the founder of Strategic Concepts (India) Pvt Ltd in 1998. He has mentored brands like ICICI, Airtel, Tata Indicom, Grind Master, Osborne Lippert, Bosch, SuKam, Godrej&Boyce, Nestle,Cahors Group and many more.